Leaders from Israel’s Bedouin community in the Negev met with the mayor of Arad Tuesday, to express their condolences following last week’s terror attack which left a 19-year-old IDF soldier dead. Last Thursday, two terrorists stabbed Ron Yitzhak Kukia to death at a bus stop outside of a mall in the southern town of Arad. After slaying Kukia, the two terrorists stole his army-issued rifle and fled the scene. 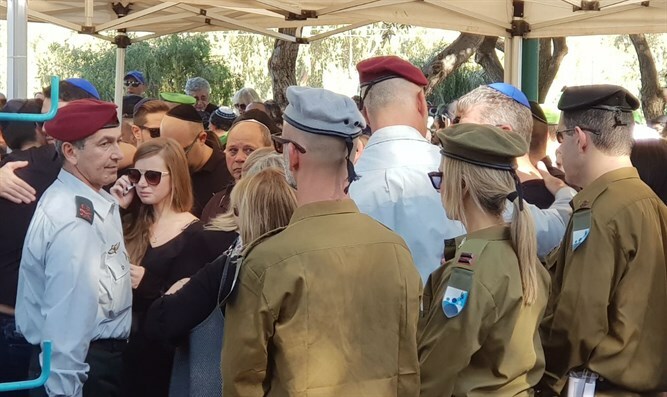 Kukia was laid to rest Sunday in an army cemetery in Arad. On Monday, the Shin Bet internal security agency announced that the two terrorists responsible for the killing had been captured. The suspects were identified as Israeli citizens and members of the Bedouin community. Following the revelation, the mayors of five Bedouin towns in the Negev met with the mayor of Arad, Nissan Ben Hemo on Tuesday, the Branza local news outlet in southern Israel reported. The delegation included the mayors of Ararat an-Naqab, Kuseife, Al Kasom, Hura, and Rahat. The mayors expressed their condolences to Ben Hemo, condemned the murder, and called for efforts to cleanse their communities of radical elements. According to a report by Hahadashot Monday, the terrorists are suspected of having ties to the ISIS terror organization. “We must spit out all of the evil elements from our population,” said Al Kasom Mayor Jabber Abu Khaf, urging parents to prevent their children from becoming radicalized by ISIS or other terror groups. Rahat Mayor Talal al-Karnawi told Ben Hemo the murderers did not represent the greater Bedouin community.